Two months after Stern Pinball gave the world a sneak peak of its highly anticipated Batman 66 game pinballers will be able to see the table live and in action. 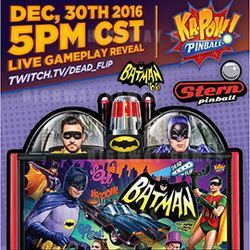 Jack Danger from Dead Flip: Pinball Streaming announced on Facebook on December 20 that he would be playing Batman 66 live for all to see on December 30. The live gameplay would be streamed on the Dead Flip Twitch TV channel. Stern Pinball released a first look of its Batman SLE Pinball on October 14, via its Facebook page. “This special edition game was made to celebrate 30 years of Stern Pinball and 50 years of Batman! This machine is a pre-production version and may be subject to changes or additions,” Stern Pinball said on the three minute video it posted to Facebook showing off the table, which was lit up and playing theme music. The company also made it clear that the products they were showing on Facebook were pre-production versions. “Little errors and small things that seem odd are for that reason,” Stern Pinball said. Stern was set to show its Batman 66 table off at 2016 IAAPA Attractions Expo. However, it was not on public display. Batman 66 pinball takes players on a feature-packed adventure though the world of the dynamic duo of Batman and Robin. The table features action video footage from the iconic TV series which has been blended with all new animations and display effects on the LED screen and integrated into game play events. The rotating action turntable mini playfield presents the player with numerous alternating shots and targets. Batman '66 features a modern version of one of the most popular toys in the history of modern pinball – the interactive crane from Batman The Dark Knight. Only 80 Batman Limited Edition machines will be made. One hundred and twenty Episode and Gadget edition tables will be made. You can read more about Batman 66 by clicking here. Batman 66 live gameplay reveal will be done at Stern’s factor on December 30, 2016 from 5PM CST. You can watch here: Twitch.tv/dead_flip.